All watches on sale today. This is a fan page devoted to famous 24 hour watches of Russian wristwatch brand Raketa, produced by Petrodvorets Watch Factory. Beside detailed information on these notable excellent watches we included also some pages about Raket brand in general, its history, catalogues, and on 24 hour watches made by other brands. The website is a mixture of Russian and English texts. All the information quoted is in original language. It should not be a major concern for today's Google Translate time. 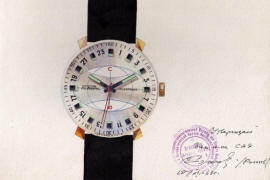 We are not a copyright holder of any of the materials presented on raketa24.com unless expressly stated otherwise. If you own the rights to any of these materials and do not want them reproduced here please let us know and we will remove the material immediately. This site is made by fan for fans and is not in any way related to the official Petrodvorets Watch Factory. My friends call me Afka. Usually in different watch forums I'm using this username and the avatar on the left. I am not a dog, but I like dogs. This dog on picture is not my dog. I don't have a dog now, all my dogs are gone. I'm an old man collecting watches, especially 24 hour watches. Why? Don't know, maybe because 24 hour watches (with the hour hand moving like a sun) are showing how the time is passing by and the current day is progressing. Most people think that 24h watches are weird and not legible. I like some other weird stuff. Like stuff made by Frank Zappa, Piotr Mamonov (and his band Zvuki Mu), Kurt Vonnegut, Kozma Prutkov. Most people think that these artists are weird and comic. For me they are dead serious and telling the truth through the beautiful language of art. A propos. 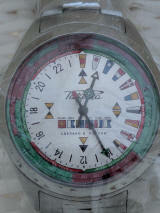 The watch you see in the right corner above has as a background legendary Raketa Polyarnye (Polar) from 1969. One of the most sought after 24 hour watch produced by Raketa. 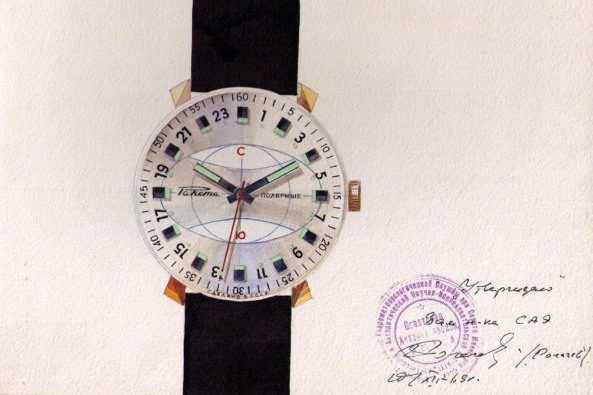 Here is the original drawing from 1969, confirmed and signed by deputy manager of Soviet Antarctic Expedition Vyacheslav Mikhaylovich Rogachev. The virtual movement of the watch has modified code originally written by Andreas Renberg. Copyright © 2017 Afka. All Rights Reserved.